Hannah Cooper McCauley: I first became involved with photography when I was in my senior year of high school. I had just moved to Alabama from my home state of Mississippi not long before and was having a difficult time adjusting. I had also recently discovered that I had a degenerative eye condition called optic nerve head drusen, which causes mild visual field loss. My parents bought me a small point and shoot camera as a gift, and I quickly found that making photographs helped to combat the loneliness and frustration I was feeling at the time. I started saving immediately for a digital SLR camera, and once I began college I knew that I wanted to work in the medium for good. I had always known I wanted to pursue a career in art, but originally I wanted to work as a cartoonist, creating stories or developing my own cartoon for a television network such as Nickelodeon. I think I fell in love with photography as a medium because it allowed me to express the things I was feeling at the time in a way that made sense to me, and a photograph seemed so much more visceral and tangible to me than anything else. I was also very much obsessed at the time with what I could and could not see, since the idea of losing my vision was on my mind. I wanted to be able to find comfort in the reality I was facing, but I longed for my life to be something a bit more magical or miraculous than what it was. The photographs I made allowed me to straddle a precarious threshold, with one foot imbedded in reality while the other dangled in the fictitious. I also found that I really loved the idea of creating open-ended narrative with my work, because that allowed me to talk about how I felt without having to directly voice it by using metaphor. F-Stop: The current issue of F-Stop Magazine includes images from your project “A Singular Sense of Urgency,” can you tell us about this project? How did this project come about? HCM: I began this project a year ago at the start of my second year of graduate school. A lot of my work deals with the notion of transition in some way because it has routinely steered my life from the time I was born. My father is a Baptist minister, and the nature of his job meant that my family moved around pretty often my whole life. I suddenly found myself in a completely new period of transition because I was recently married, living in a new state, and in the middle of grad school. Even though I am used to change, I was exploring a new identity as a wife and lover, and for the first time in my life I was faced with idea of motherhood, and I was contemplating how that might fit into my life. So I began to make this work as a response to that as well as my sort of kinship with temporary. I wanted to use open-ended narrative as a way to address my fears and desires in an abstract way. Many of the images are also self-portraits because there is a performative aspect to making the work that I really enjoy. While in school, I’ve been researching the narrative mode of magical realism, and this largely influenced the way I construct my imagery. When I consider the environment I was raised in, this makes sense; I was taught to believe in the probability of miracles, and to accept the things I couldn’t understand. I learned a lot of lessons through parables, where the use of metaphor was paramount. So I think that even as an adult, I am still looking for the miraculous within the ordinary. F-Stop: Can you discuss your process for making these images or your creative process more generally? What were you looking to capture? HCM: Oftentimes I will begin with an idea for an image based on a memory, a dream, or from own my family mythology. Quality of light plays a huge role in my decision to make an image; I try to look for environments where it can personify an emotion. Many of my images are composites, so I typically combine several images to get one that works best. I also think about the color palette of the image; I’m really drawn to red, so I try to use it as a connecting thread throughout the photographs, to move the narrative or express a specific mood. I generally try to do this with all of my images; I think that color and quality of light are what I am most drawn to when looking at photographs. I believe that the thing I am always trying to capture is the way something feels; usually it’s connected to what I am feeling at the time. I’m want to feel connected to others through my work. What I love most about photography is the way it can be used as a tool to facilitate empathy. F-Stop: What do you hope people see or feel or perhaps learn when they look at your photographs? HCM: I think that’s difficult to say; I know that everyone is going to bring their own personal baggage to the work, and they’ll probably interpret it based on their own experiences. But I think that what I would like for people to generally feel is the wealth and immensity of human emotion; that you aren’t alone, and that people are really not all that different from one another. HCM: I don’t think I have a favorite image in the series; I’ve really enjoyed making each one for various reasons. 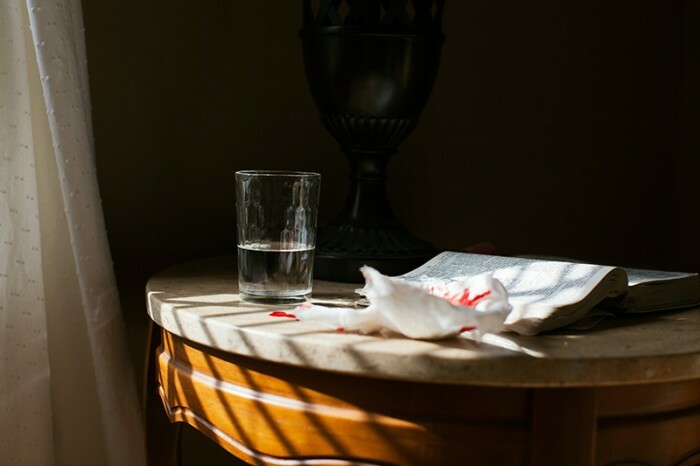 But one of the most memorable ones is the image of the glass on the table next to a bloody tissue and an old bible. I made the image around Thanksgiving while my husband and I were visiting my parents. My mother had cut her hand while cooking, and it was bleeding an awful lot, almost an absurd amount. So I asked her if I could borrow her to make a photograph and she kindly obliged, which I feel really lucky to have a mom who doesn’t mind supporting me without asking too many questions. And I always really enjoy it when I get to collaborate with someone to make an image. I also enjoy that photograph because the color and quality of light remind me of some other place I might have been, as if that exposure was made in some other universe or at a different time; that’s what I call it The Other Mother— I guess there is something about it that just seems other worldly to me. HCM: Yes, I am! I’ve been photographing my husband Zachary, who is also a photographer. There are many examples throughout the medium’s history of male photographers documenting their wives, like Harry Callahan and Emmet Gowin, but there only seems to be a handful of women photographing their husbands, such as Sally Mann’s beautiful images of her husband So I’m interested in providing my own interpretation of that. That’s a long term project. Short term, I am in the midst of making my thesis work for my final year of grad school, which will involve an autobiographical interpretation of magical realism, but since I am in the throes of it I won’t say too much yet! 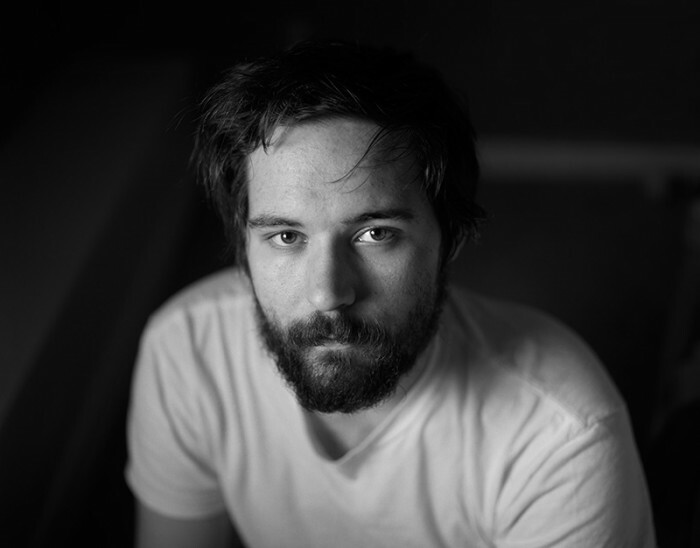 HCM: I think I’m most directly inspired by my husband Zachary, who is in the photography MFA program with me at Louisiana Tech. We talk about photography all day every day, and he is always willing to listen to me as I work through an idea and provides indispensable feedback And since we are both working in the same medium, we definitely feed off of one another. I’m also really inspired by cinema, specifically the films of M. Night Shyamalan such as Unbreakable, The Village, and The Sixth Sense. He’s really wonderful at using color in an expressive way, and all of those stories involve reality being sort of interrupted by the unreal. I’m also a big fan of the short stories of Japanese novelist Haruki Murakami, which were my introduction to the genre of magical realism. 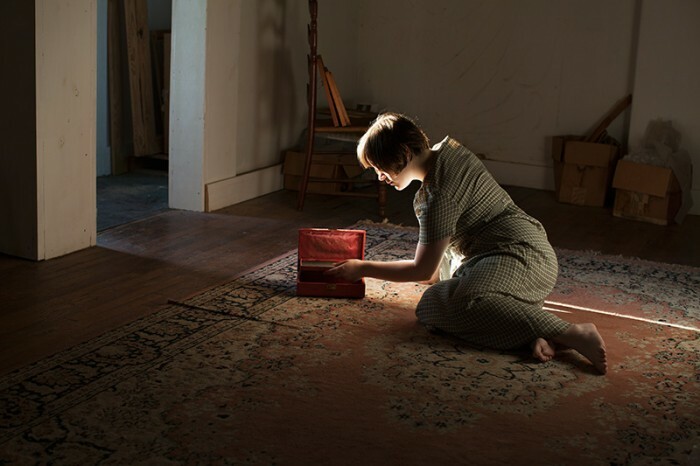 As far as photographers, I am continually stirred by the work of Susan Worsham, Cig Harvey, and Keith Carter. 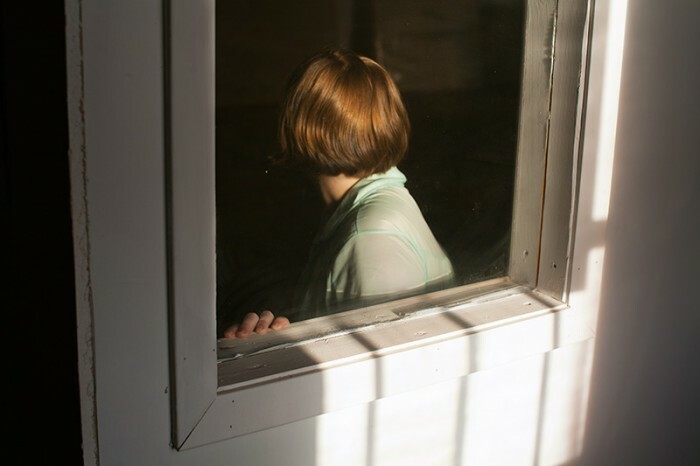 Cig Harvey and Susan Worsham both use color in the most beautiful way, while Keith Carter’s idea of using photography as the poetry of your life really resonates with me.